Direct coupled actuators for air dampers, ventilation flaps, louvers and VAV-units. 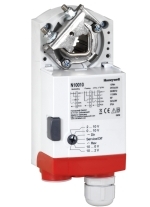 • Removable wiring box, with cable gland M20x1,5 1/2" NPT. • Rotation direction selectable by switch. • Adjustable mechanical end limits included.